Everyone's familiar with chicken parmesan (which my husband orders just about every time we go to an Italian restaurant). Or even eggplant parmesan. But how about zucchini parmesan? This was a new idea to me. We had a huge zucchini in our CSA box this week. I was thinking about how I wanted to cook it, when I was somehow inspired to take a parmesan approach! 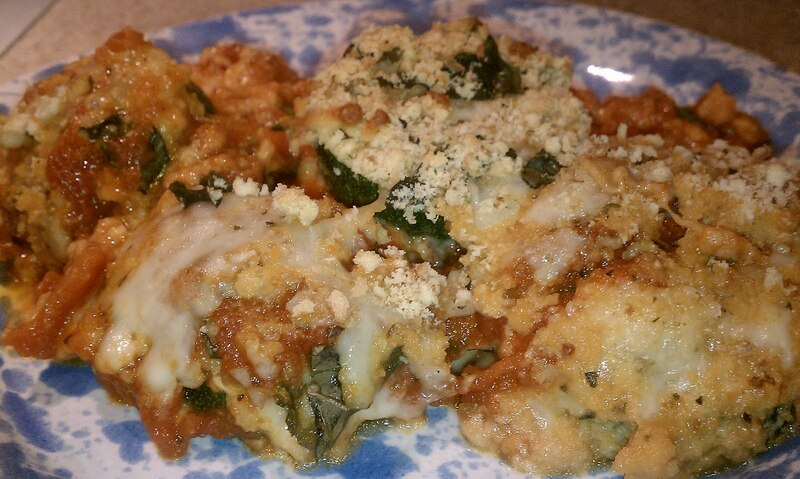 The recipe is fairly similar to how you would make an eggplant parmesan. Just switch out the veggie you're using. To modify this recipe, I decided to use some of my leftover prep ingredients and incorporate them into the layers. I usually end up throwing away the extra breadcrumbs (because they're contaminated with egg) and remaining beaten egg (because it's contaminated with breadcrumbs) after I'm done dipping the veggie slices in them. This time, I decided to add the extra breadcrumbs to the leftover egg, mix it up, and then put dollops of it across the tops of the first layer of zucchini when assembling the casserole. When I went to get a jar of sauce out of our cupboard to make this recipe, I was happy to find one more jar of my favorite spaghetti sauce. 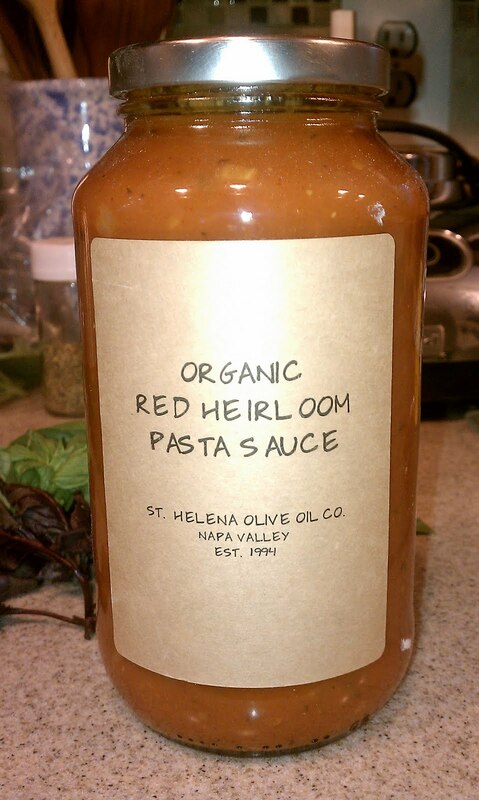 It's from St. Helena Olive Oil Company. If you every take a trip out to wine country in the Napa Valley, I highly recommend getting some of their olive oil, vinegar and pasta sauce. It is beyond delicious! I could just eat their sauce straight out of the jar with a spoon! I'm sad this was our last jar! We really enjoyed it, anyway! Note: I used rice bread crumbs to make this gluten-free and used one huge zucchini, which I would estimate is the equivalent of 3 normal-sized ones. Preheat oven to 375 degrees. Lightly grease a large baking sheet, or use a silicone mat (I used my Silpat mat). In a shallow, medium bowl, mix bread crumbs, parmesan cheese, garlic, basil, and oregano. 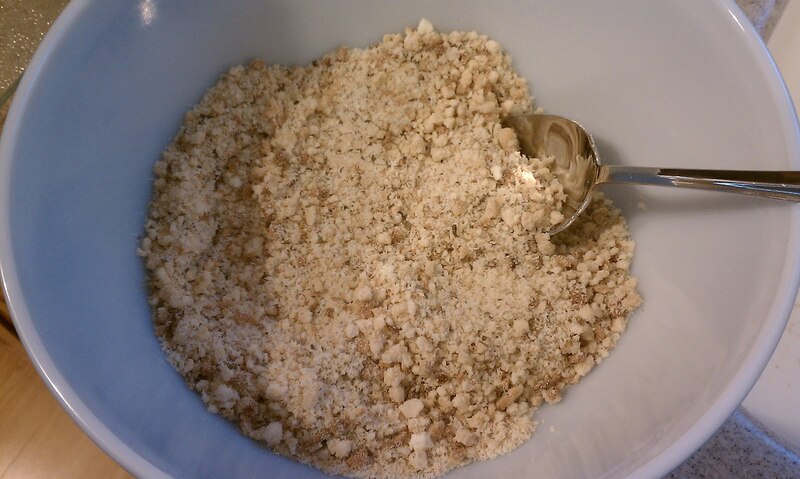 Set aside 2/3 cup of the mixture. Place 2 egg in a small bowl and beat. Dip zucchini slices in the egg, then coat with the bread crumb mixture. Arrange coated slices on the prepared baking sheet, and bake 12 to 15 minutes in the preheated oven, until lightly browned. 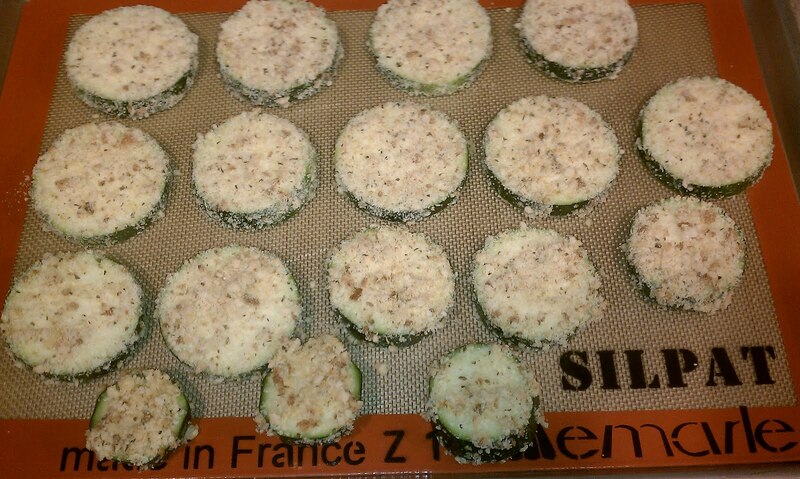 While the zucchini slices are baking, take any leftover breadcrumbs from dipping and add them into any remaining egg and mix. Set aside. 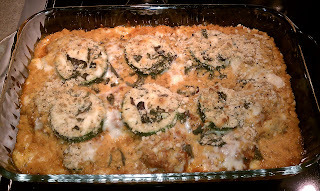 Once the zucchini is done baking, spread 1/2 the tomato sauce in the bottom of a 9x13 inch baking dish. 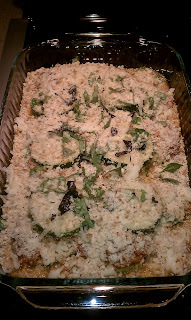 Layer with 1/2 the zucchini, the leftover breadcrumb and egg mixture, 1/2 the chopped fresh basil and 1/2 the mozzarella cheese. Repeat with a layer of sauce, zucchini, cheese and basil, and then top with the reserved bread crumb mixture. 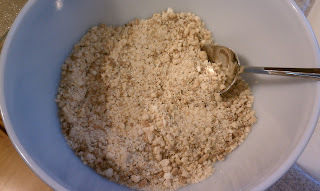 Put in oven and bake for approximately 20 minutes, until cheese is bubbly and breadcrumb topping starts to brown. Yum! I'll try to make this this week. Matt may or may not eat; same with the girls - but, who cares! More for me!